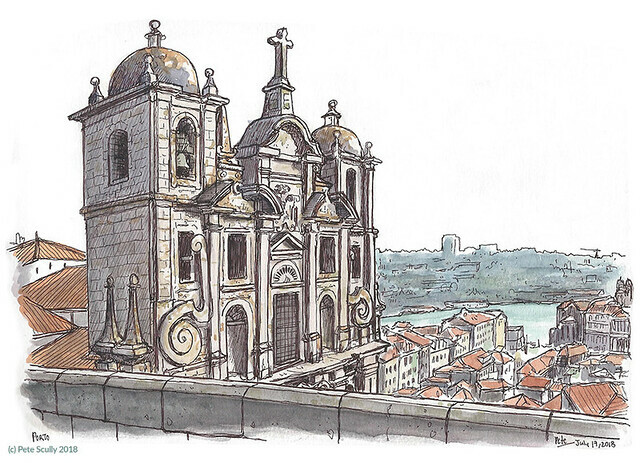 It is time to post my Porto sketches, and I have decided against the linear storytelling method of posting, rather I will loosely theme my blogs, and when I say loose, I probably mean barely connected at all. I will tell the story of the symposium from my own point of view, the people I met, the places I visited, the panoramas, the perspectives, the perambulations, and other words that will inevitably all begin with ‘p’. In fact the letter ‘p’ will probably be the prominent/predominant theme. Photos will be presented along with pen, pencil and paint pictures. So without further pause, let’s proceed. I arrived in Porto from Madrid and took a cheap shuttle from the airport to a downtown bus station that was unfortunately just outside the range of my map. Being the navigator I am, I decided to follow my nose. My nose however had other ideas and led me and my small rolling suitcase in the complete opposite direction, into a neighbourhood of steeply sloping streets, brightly coloured tiled houses, and old women standing around yelling at each other, while old men stood around shrugging at each other. My initial encounter with Porto is still how I would describe the city, even after almost a week there. I was looking for my hotel, but did not mind being lost; I wasn’t in a hurry, though I wanted to start sketching. Eventually I found my way to within the boundaries of my small Lonely Planet guidebook map (note to self, the nose can smell pastries from a hundred feet but has no sense of direction whatsoever) and made it to my hotel, on Praça Batalha. So it looks like I am starting out by telling this story chronologically after all. Well let’s move on from that, and go with the theme of exploring. Hang on, that doesn’t begin with a ‘p’. ‘Perspiration’, perhaps, from all the steep hill-climbing this city forces you to do. Ok then, let’s start with ‘perspectives’. 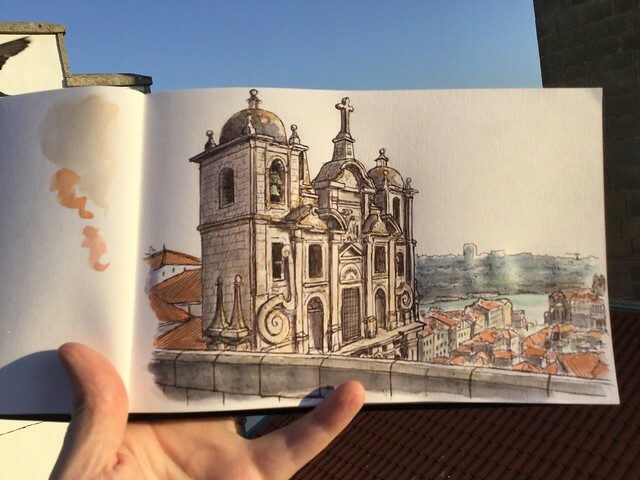 The sketch at the top of this post is São Lourenço, aka ‘Grilos’, and was in fact the fourth sketch I did on my first day in Porto. I left the hotel and explored, sketching churches and fire hydrants, and found that it was hard to get very far because everywhere is so sketchable. Everywhere you turned, an impossible view. Already several sketches in by this point, and having come across many other sketchers dotted around the city already – my people! – I felt it was time to go and eat dinner somewhere, try some local cuisine. The sun was lowering and the light was golden, and I turned around a corner and saw this view, looking over the city with the tall ornate façade of São Lourenço sweeping down a cliff like an opera in stone. There was the river Douro, there were all the orange-red rooftops, showing me that all two-dimensional maps of this city were woefully inadequate; what I had though may be short cuts turned out to be like hiking up and down impenetrable mountain paths. The perspective was exciting. I stood on a bench for a slightly better view. You can see from my eye-line how high up this was, as high as the peaks of the hills across the river. The street down below in the distance is roughly parallel to this building so followed through to the same vanishing point, but other streets twisted and followed their own paths. 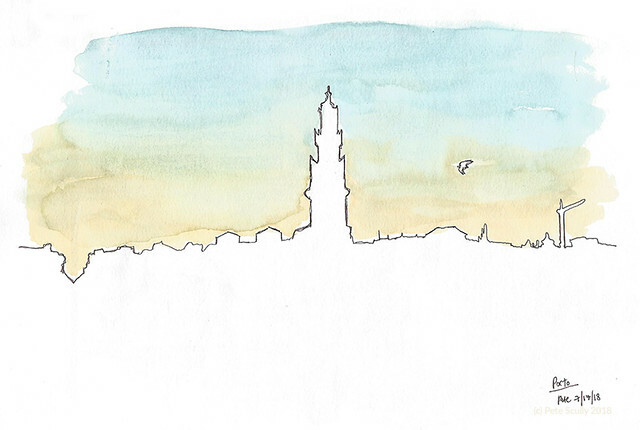 I was pleased when I was done as it was the first Porto sketch I did that I felt encompassed how I saw the city (I hadn’t even drawn the bridge yet…). As I sketched I overheard young travelers from other countries talking the way young travelers do, the way I might have done twenty years ago when I was a young backpacker. I spoke to a few other sketchers, all of whom had the same ‘I must stop and sketch this now!’ moment I did. This view was one of many epic views over the city I would encounter, and you can’t draw them all but at certain times of day the light demands it. Dinner can wait. I ended up having a cheap kebab on Aliados if you must know, followed by a Nata. Well, there was another view I wanted to draw, the rooftops with the iconic Clerigos towering above them. All I had time for was the outline, and the glowing dusk. I think I will stop here for now. Please join me for the next chapter, which will either be “Porto People”, “Porto Parrochial”, or “Porto Postcards”. Or perhaps none of those?